Yes there is a minimum of 1-years warranty on all our products, on some products we offer a 5-year limited warranty against manufacturer's defects. Yes, please see Shipping, Returns and PO's for details. 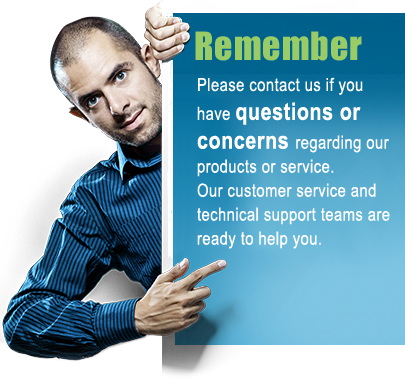 Do you provide technical support on your products? Yes, we do provide full technical support for all our products by our fast and efficient email support. We also offer our Tech Help webpage, which provide lots of technical help and advice on installation and use of our products. All products can be returned for a refund within 30 days. Please see Shipping and Returns for details. NOTICE: An RMA form must be included with all returns. Please download the RMA form here. USPS Express and UPS Overnight orders received before 12 noon CST will usually be shipped out the same day. All other orders and orders received after 12 noon CST will be shipped out the next day. However, due to large order volumes, weather conditions or circumstances beyond our control, we cannot always guarantee the aforementioned delivery times, but we will definately do our best. Products are shipped from our warehuse in Kansas City, KS, United States. For more details please see our Shipping and Returns policy. Do you allow local pick-up? Unfortunately at this time we do not have the resources to accept local pick-up of products. Can I order online and pay with my credit card? Yes, you can pay with any major credit card or PayPal when you place an order on our website. Can you give a discount if I buy higher quantities? Yes, the more you buy the more you save! Most likely we will be able to give you the best price on the market. Please contact us before you order. Absolutely! Did you see a lower price at a competitior? U.S. Converters LLC will meet and beat it by 10%. If you find a current lower price on an identical in-stock item from any retailer, we will match the price and beat it by 10%. Can you provide products for my specific needs? We will be happy to work with you to find a solution that suits your needs, however the minimum quantity for custom orders is usually 100 units.